Vytautas Kazimieras Jonynas was born in 1907 in Lithuania. He studied art at the Art School of Kaunas and took courses from the noted Lithuanian art instructors Adomas Varnas and Adomas Galdikas. 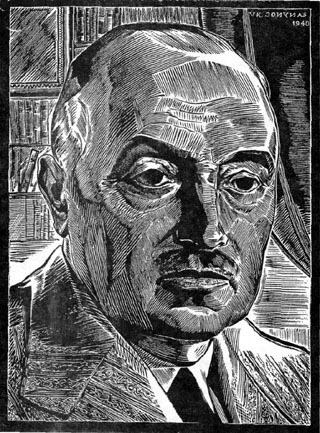 In 1931 Jonynas went to Paris where he studied woodengraving, book illustrating, wood sculpture and furniture design at the Conservatoire National des Arts et Metiers and Ecole Boulle. In 1937 he received two gold medals, one for wood engraving and another for posters at the Paris World's Fair. In 1938 he was awarded the rank of officer in the French Legion of Honor by the French government. Jonynas has an impressive teaching career which started in 1935 at the Art School of Kaunas, Lithuania. From 1941 to 1944 he was director and art teacher at the Institute of Art and Applied Art in Kaunas. 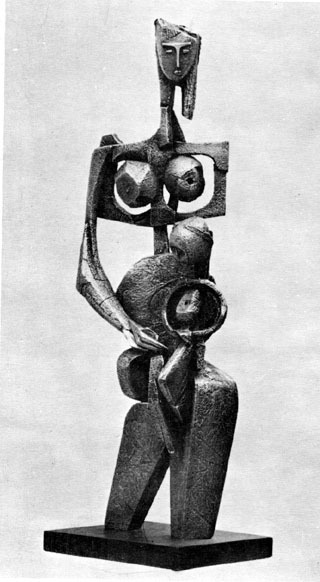 In 1946 he founded the Foreign Artists' Institute of Fine Arts in Freiburg, Germany. He was director and teacher at the Institute until 1950. Before immigrating to the United States in 1951, he was a docent for Graphic Art at the Art and Architectural School in Mainz, Germany, and Art Consultant to the French High Commission in Germany. From 1951 to 1957 he taught art at the Catan-Rose Institute of Fine Arts in Jamaica, N.Y. and from 1957 to 1973 he was art teacher at Fordham University, Bronx, N.Y.
Jonynas exhibited his works in France, Latvia, Germany, Italy, the United States, and Lithuania, and is represented in the collections of major museums in Lithuania, Latvia, Estonia, Germany, Belgium, Holland, the USA, and the Vatican. Jonynas' earliest works were woodcuts. He is credited with making the first woodcut ever in Lithuanian art history. That was in 1927. 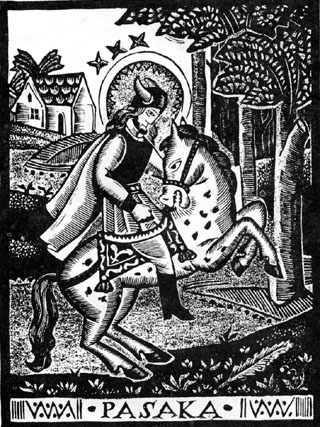 The series of woodcuts made in his early years followed the style of the traditional folk art sculptures (picture), but also exhibited traits of his personal stylistic tendencies which he perfected later in life (picture). His early portraits are noted for their stress on the importance of the line (picture). 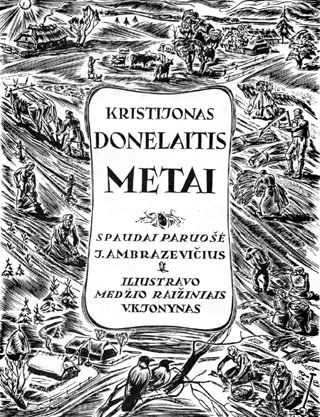 Jonynas' most important ouvre of this period are his illustrations for Donelaitis' (1714-1780) poem "Metai" (Seasons) for which he won the Lithuanian National Prize in 1940 (picture). 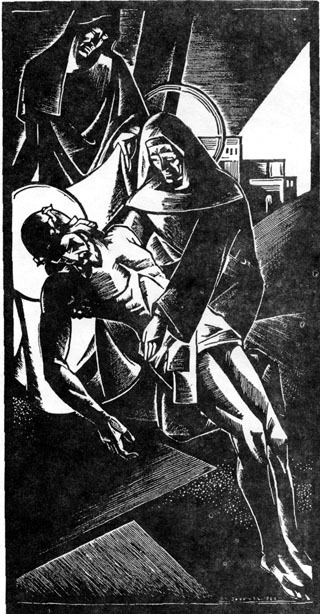 A significant departure from the "down to earth" realism of "Metai" and other early woodcuts are Jonynas' subsequent works in the art of book illustration. William Shakespeare's "Hamlet" and Johann Wolfgang Goethe's "Die Leiden des Jungen Werters" (The Sorrows of the Young Werter) display a greater freedom and play-fulness of line than his previous works. While in Germany, Jonynas was asked to design a set of stamps for the French zones in Baden, Rheinland-Pfalz, the Saar and Wuertenberg. He created 35 postage stamp designs, from which 57 stamps with varying prices were placed in circulation in 1947 and 1948. 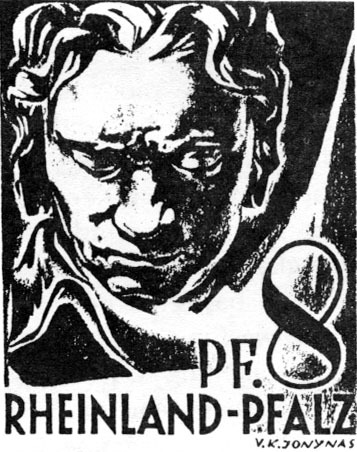 They have been described as the most artistic stamps ever issued in Germany. Later, he produced two stamps for the Vatican, commemorating the 500th anniversary of the birth of St. Casimir, patron saint of Lithuania. They were issued December 14, 1959. Jonynas is the first American artist who produced stamps for the Vatican. His inquisitive spirit soon led him to the exploration of other media of expression. Jonynas worked in watercolors, oils, sculpture, stained glass, furniture and architectural designs. In his watercolors and oils, just as in his woodcuts, Jonynas makes use of the line as a dividing factor of form. The technique of incisive lines sets Jonynas' watercolors apart, giving their naturally diffused colors pronounced contours and character. Jonynas' bas-reliefs and three-dimensional sculptures combine elements of portraiture, linear art, and abstract form. 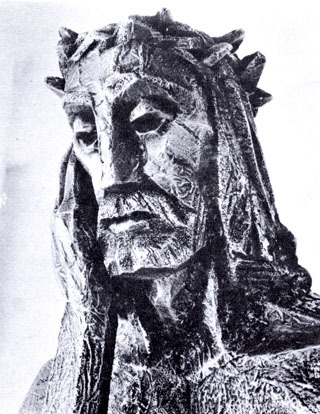 The figure (which in Jonynas' commissioned works usually portrays the likeness of the saints or Jesus) is derived from the models of Lithuanian folk art wood carvings, Jonynas takes great pains to reproduce in metal or clay the weathered texture of the aging wood, giving the soft aluminum surface an unexpected strength and virility. . In his abstract sculpture, he searches for a perfect combination of form, harmony and balance of structural lines and shapes which unite into what he calls "a symphony of form" (picture). The City of New York commissioned Jonynas to create a mural. 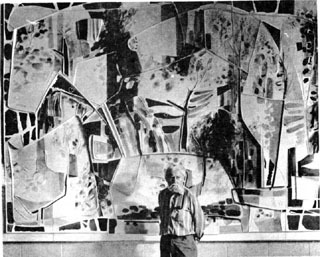 He developed a new technique of bas-relief, sculpture, glass mosaics and fresco paintings, which is unique in art history (picture). 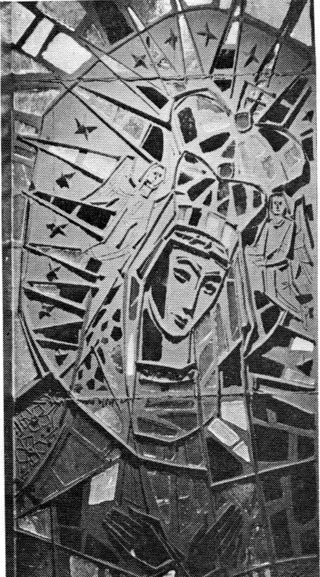 Most of his stained glass pieces were done in a traditional style to satisfy the pious and devoted church goers. But here again he did not hesitate to introduce a new and unexpected style. The chapel in the Lithuanian Franciscan monastery in Kennebunkport, Maine, prides itself on its slab glass windows which Jonynas executed partially in glass and partially in cement (picture). Including areas of solid bas-relief next to the transparent glass made the windows functional both in daytime and nighttime when indoor lighting is used. About this unusual combination of opaqueness and transparence, Jonynas simply says: "When the monks come to the chapel for prayer before dawn, they see objects of their devotion lit by spotlights from inside. At daybreak the windows start shining using the sunlight coming from outside. This move between daylight and artificial light provides the viewer with a richer devotional and esthetic experience." Jonynas' architectural designs also were created with function and service in mind. He decorated the church of the Nativity of the Blessed Virgin Mary which serves the Chicago Lithuanian Catholic community in Marquette Park with exquisite Lithuanian folk art motifs. 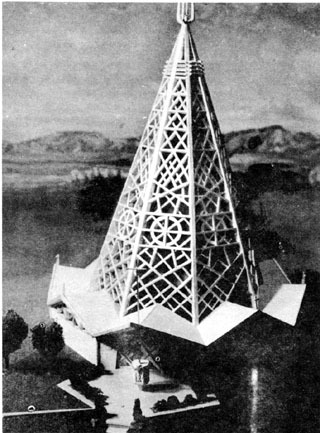 The unique design of St. Labre Indian Mission in Ashland, Montana, depicts a steeple in the shape of an Indian teepee decorated with intertwining structural lines and stained glass, reminiscent of the native American's taste for bold design and bright colors (picture). Major retrospective exhibitions of his works have been hung in Lithuania and new shows are being planned, which result in more material being published about Jonynas. Jonynas himself attributes his prodigious vitality and inventiveness to the fact that he has been endowed with an inquiring mind which constantly makes demands on his time and resources to learn more, to search for new ways of expressing his ideas and feelings. 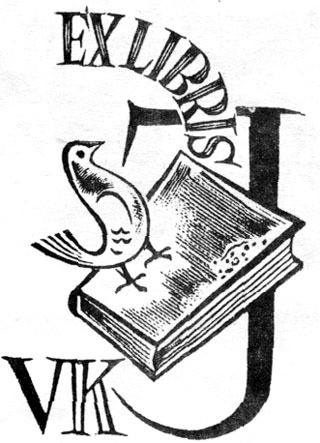 Postage stamp designed by V.K. Jonynas.